TOMI's campaign to nurture the growth and success of the Tezos developer community will blossom through exciting activities and programs over the coming months and years. In-person intensive education. Our pilot program is a weekend immersive course in Los Angeles taught by CalTech PhD, Dr. Debajoti Ray. Tuition, meals, room and board are all covered. Application season will be open soon. 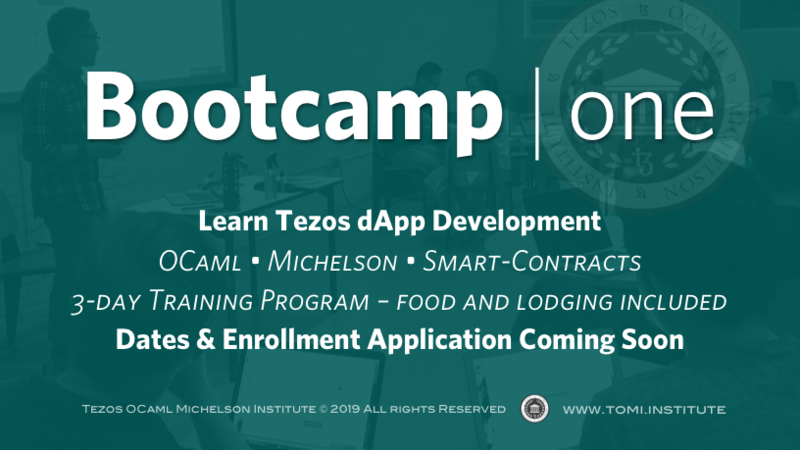 If your business or blockchain project—with staffed in-house developers—is in need of live Tezos-OCaml-Michelson training, you may be able to contract with TOMI to provide training to your developers at the convenience of your own office location. If you would like your university or other institute of higher learning to teach a course on OCaml or expand their current OCaml offerings, we can help. TOMI is developing classroom courseware for educational institutions. After iterating our bootcamp model, we will take TOMI Bootcamp overseas to key English-speaking developer cities around the world. If you are interested in seeing TOMI come to your city, let us know. TOMI's long-term project is to develop comprehensive and constantly iterating online courseware for the global Tezos community – designed not only for seasoned developers but for entry-level coders as well. Tezos OCaml Michelson Certified Accredited Technologist (TOMCAT) – is a credential that a bona fide Tezos developer may exhibit to employers, investors, and other institutions as evidence of their formal training and expertise in TOM. To earn a TOMCAT credential a candidate must fulfill the requirements of the TOMCAT examination. The developers beind the most amazing future Tezos dApps will start here. Our 3-day immersive experience in Los Angeles, coming Spring 2019. You'll learn Tezos, OCaml, and Michelson—to write your own Tezos smart-contracts. By the end of the course, students will have developed their own smart-contracts deployed on Tezos alphanet, and should feel equipped to independently develop Tezos dApps. Selection criteria will be based on a combination of expressed interest in Tezos and basic development skills. Costs of food, lodging, and tution are all covered. Application coming soon. Sign-up to be notified. If you would like your university or other institute of higher learning to teach a course on OCaml or Michelson, or if you'd like them to expand their current OCaml offerings, we can help. Whether you're a student, alumni, faculty member, or school administrator, you can request that your school become a TOMI Institutional Partner. Simply click the button that says: "Request Institutional Partnership"
Want your school to teach Tezos, OCaml, Michelson? © Copyright 2018–2019 | Tezos OCaml Michelson Institute | Los Angeles, California | All rights reserved.